All wood, vinyl, brick and aluminum surfaces on your house can be cleaned to look great! We also clean concrete and brick walkways, and can hand scrub or "whiten" your oxidized gutters. Do you have a problem area? A spot that your pet just can't get enough of? If you do, we have the answer for you! We can safely remove built up dirt and grime and return your grout to its original condition kitchen floors, entrance ways, bathrooms and countertops. Whether you have a commercial building or a private residence, we can accommodate your needs. Cleaning improves the appearance and increases the life of your carpet. At Spotless, we use a variable high pressure machine and we can control the pressure of the spray with different tips best suited for your deck's needs, thus enabling a smooth, even finish with minimal splintering and NO GOUGING. We use only the highest quality stains and sealers. We hand apply your stain/sealer one section at a time; this ensures a nice even finish. Cleaning improves the appearance and increases the life of your carpet. We use the Industry's most recognized and effective cleaning processes. If you or anyone in your family identifies with: Asthma, Eczema, Hay Fever, Bronchitis, Itchy-Red-Eyes, Sinus Pain, Frequent Headaches, Fatigue or even Depression when you first wake up... you very well may be "Sleeping with Enemies." Using our Patented Roof Cleaning System, Spotless can safely remove this Deteriorating Fungus and make your Old Roof look "New" again! Spotless is an independent owner-operated cleaning service business. We have the manpower, equipment and products to handle most aspects of residential, commercial and industrial cleaning. We are fully licensed, bonded and insured. Certified for window cleaning by the I.W.C.A. Certified for carpet cleaning by the I.I.C.R.C. Certified for power washing by the P.W.N.A. Certified in marble, ceramic tile and stone care by the I.I.C.R.C. 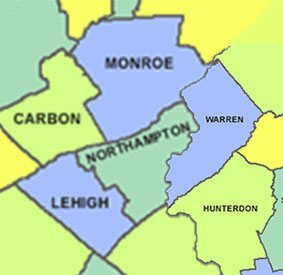 We proudly serve Hunterdon, Monroe, Warren, Northampton Counties, Lehigh & Bucks County. "If Your Home Isn't Becoming To You, You Should Be Coming To Us!" We accept all insurance claims! We are NOT affiliated with any insurance company. We represent you to ensure you get the service to which you are Entitled. They were very efficient and did a wonderful job cleaning my windows and screens.